Thousands occupied streets and attacked public buildings in the south-central Vietnamese province of Binh Thuan on Monday, the second day of what officials described as a ‘riot-like’ situation that had escalated from organized marches to oppose a controversial land policy. As of midnight on Monday, thousands still surrounded the provincial administration’s headquarters in the capital city of Phan Thiet as police officers retreated inside the building to hold their ground against the incited crowd. The mob gathered there at around 8:00 pm, and started throwing rocks and petrol bombs at officers stationed inside. Dozens of police officers were hurt in the assault, with some suffering from broken arms and legs, according to local police. Messages calling for the crowd to refrain from violent actions were broadcast via public loudspeakers across the city’s downtown to little effect as the mob still refused to disperse as of 11:30 pm. 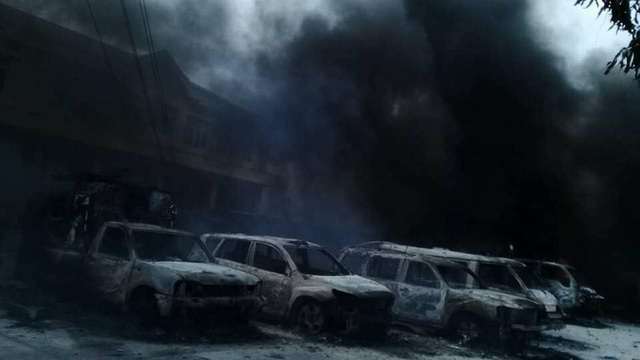 Many broke into a fire police station nearby and set fire to dozens of vehicles parked inside. It was the second day of escalating violence in Phan Thiet, following the arrest of 102 people involved in the ‘riot-like’ incident on Sunday. Aside from Binh Thuan, marches also began in different areas of Vietnam on Sunday as people took to the streets to raise their voice against a draft law that would allow land to be leased for up to 99 years to potential foreign investors in the country’s three planned special administrative and economic zones. The zones – Phu Quoc, Van Don and Bac Van Phong – are to be located in Kien Giang, Quang Ninh and Khanh Hoa Provinces in the southern, northern and south-central parts of the country, respectively. Development of the three zones is estimated to set Vietnam back US$69.16 billion as the country looks to win more foreign investment through greater incentives and fewer restrictions in the areas. Critics of the government-prepared bill, which if passed would lay the legal foundation for the establishment of the special zones, object to the 99-year land lease for fear of threats to national security. Despite the Vietnamese government having pledged to scale down the lease period and the lawmaking National Assembly having agreed to delay consideration of the bill until October, opponents of the draft law are not satisfied. In Binh Thuan, street occupants became agitated and started hurling rocks and hard objects at police officers on Sunday afternoon as they blocked a part of National Highway 1, causing a kilometers-long line of congested vehicles on the lifeline road. Another mob that assembled in downtown Phan Thiet turned violent when they broke into the headquarters of the provincial administration and other public buildings on Sunday evening and caused substantial damage to the properties despite police efforts to contain the crowd using water cannons. Officials said on Monday 102 had been detained for involvement in the vandalism, but later said they had released 95 following a screening process. At a press briefing on Monday afternoon to update the media on current situations, a local official said the aftermath of the attacks was “unimaginable” and unprecedented in the province. While the Constitution of Vietnam protects citizens’ right to stage protests, the subject has not been codified by any existing law, according to Nguyen Minh Tam, deputy general secretary of the Vietnam Bar Association. “I understand the people’s patriotism in the face of threats to the country’s sovereignty … but peacefully raising one’s opinion and disturbing public order are different things,” he said. While the situation is more contained in other areas, police in Ho Chi Minh City said they had captured over 150 people who were found inciting others to commit violence against law enforcement during the marches on Sunday. “We have been able to confirm that there are reactionary units behind the violence,” said Nguyen Sy Quang, spokesperson of Ho Chi Minh City Police. He added that the situation in the southern metropolis had been put under control.